Did the earth move for you? It’s his fault. … Craving a lush, juicy white blend, with a knockout structure and frisky finish? Now that’s really His Fault. Did the earth move for you? It’s her fault. … Craving a sumptuous, deeply flavored blend, with a supple mouthfeel and a really long finish? Now that’s really Her Fault. The wines are bottled by Adler Fels Winery of Santa Rosa, California. 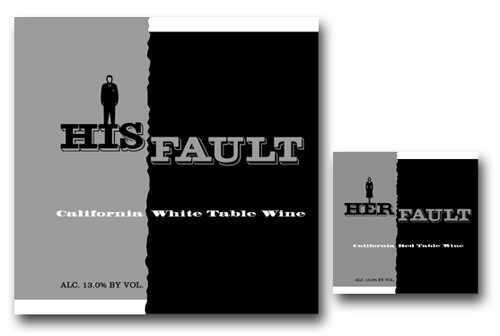 I would like to buy Her Fault and His Fault wine. I live in Marquette, Michigan 49855. Is it distributed in this area? We received bottles of this as gifts. May be issues with taxes and mailing to Michigan. Would you please tell me whether “HIS FAULT/HER FAULT” wine is available in Meijer stores in southwest Michigan? Kathy and Jim – click through to the label approval; see the contact information there. They should know where to purchase this wine. What Could be Better than Seven Daughters?